I'm feeling very entrepreneurial lately. My little invitation business on Etsy is ticking over nicely and now I've added blog design to my repertoire. My first client was the winner of my blog makeover giveaway, the lovely Neetz. Neetz's blog was previously called "Bassett Blurbs and Banter", a name she was never happy with. Neetz is a larger-than-life personality (or so I've heard from those who've had the privilege of meeting her) with a warm heart. She's also the lead singer in a Rock Band. 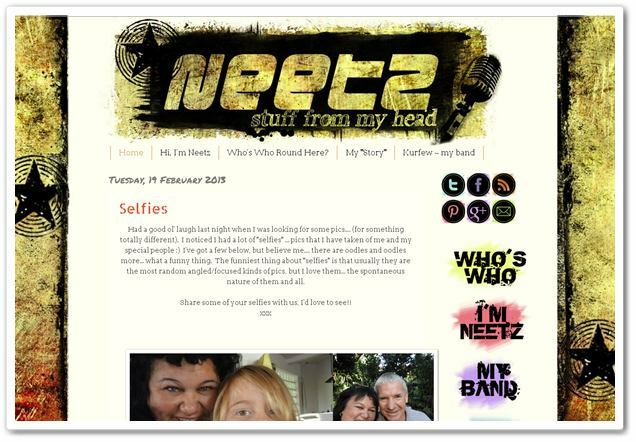 Neetz had a go at brightening up her blog by herself, but wasn't happy with the look of it, with the result that she was feeling uninspired and was blogging only sporadically. She was ecstatic to win my makeover and after a few emails back and forth we figured out that she would love a "rock chick" feel for her blog. I also suggested she consider changing her blog title simply to "Neetz", and then we simplified her tag line to "Stuff from my head". I created a grungey style header, background and matching grab-button for Neetz, along with a custom set of social media buttons and sidebar buttons - black with a wash of neon colour underneath. 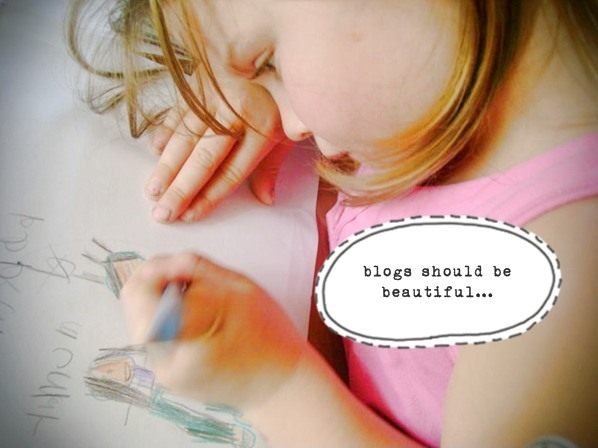 Neetz loves her new blog design and even dedicated a whole post to me, thanking me (awww shucks!). I hope you will pop by and see the new design and say "Hi" to Neetz. She's a very cool chick, with a rockin' covers band called Kurfew. And now her blog is rockin' too. 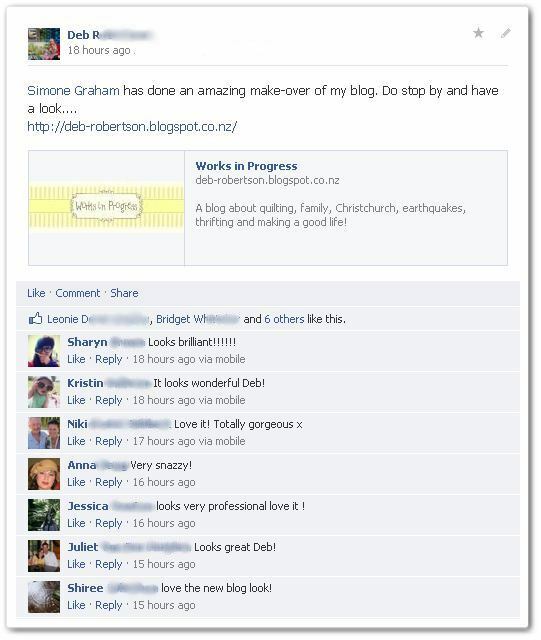 I've also just completed a design for Deb at Works in Progress, a popular blogger from Christchurch. "...I want it to look fresh and uncluttered and professional. I don't want to look mumsy or craftsy, not that there is anything wrong with this, I kinda want to be generic in that I keep changing what I write about because I write where I am now...."
I hope you'll head over to Deb's blog and see the new design for yourself (it's one of my favourites out of all the makeovers I've done). I am completely loving creating these new designs for people. As you can see the looks are completely different for each individual. I design a look that is tailored to you, who you are and what you are about. There are no carbon copy blog designs in my repertoire. 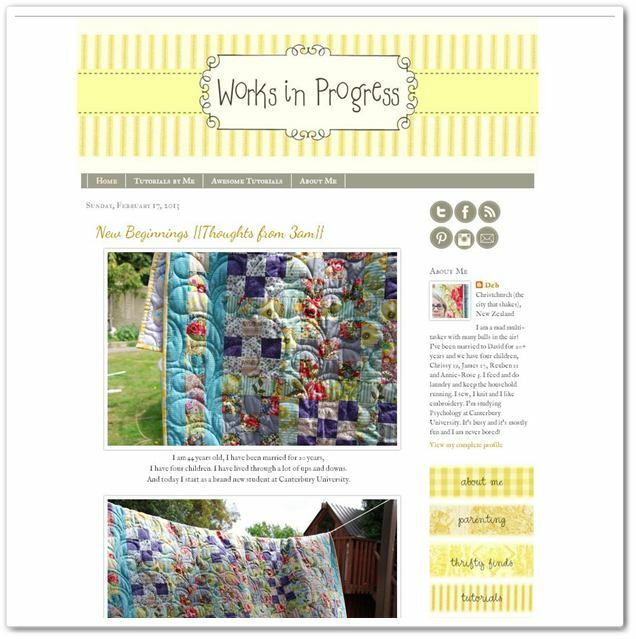 So if you are hankering after a new look for your blog check out my Custom Blog Design page... and get in touch! There are lots of different options, from a full makeover to simply a header or a button, some new pages or a combination. I can also design grab buttons for Memes and Linkies you might be running and create custom social media buttons in a style to match your blog. And now for the Freebies. A Set of Simple round (stitched) black social media buttons for you to grab. Just copy the code and paste it into a Word document. Then enter your details as shown, Save, then copy and paste into an Html gadget in your blog sidebar. Bingo - some sleek new buttons for you. What do you think? Anyone want a Blog Makeover?